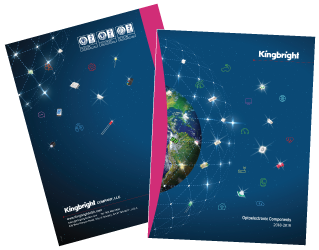 June 12th, 2017, Los Angeles, CA – Kingbright releases its latest 2018-2019 optoelectronics catalog, featuring ultra-high efficient and innovative LEDs with the latest technologies in compliant with RoHS & REACH Directives. This new catalog contains our latest product series that offer the most popular package sizes with exceptional performances in HELI-UM (world's first 0201 SMD LED), HELI-Dome (Industry's first low profile dome lens SMD LED), HELI2 (for battery operated devices or applications that requires low current/low VF) and more. Catalog content provides specifications, diagrams and photos in six product categories - High Brightness LEDs, SMD LEDs, Through-Hole LEDs, SMD Displays, Circuit Board Indicators, and Infrared & Phototransistors. Kingbright also offers full custom LED options in desired shapes, forms, color, and technical guides to accomplish design goals. For further LED design objectives or specialized requirements, please contact Kingbright sales at (909) 468-0500 or submit inquiry. Kingbright is a leading LED manufacturer producing innovative LEDs for over 30 years. Kingbright offers the most comprehensive LED products in the industry including: SMD LEDs and Displays, Circuit Board Indicators, High Brightness LEDs, Through-Hole LEDs and Displays and other LED related products. With four manufacturing plants in Shenzhen, China all accredited with TS 16949, ISO 9001, ISO 14001 certification, Kingbright adheres its core mission to dedicate technological innovation and vest in R&D projects. For more information, please visit www.KingbrightUSA.com.